We Texans think (know, actually) that “Everything is Bigger in Texas,” both real and imagined. Physically, there are the big hair hats, boots, ranches, sky, wide open spaces, money, and buildings. Psychologically, we think of big personalities, ego, will, and power. All these layers play into a myth, generated from the beginning of our history and greatly expanded since the mid-20th century by various media. Movies are based on real life and real life is based on the movies. What the world has come mistakenly to think of as Texas is symbolized by the opening frame from Red River (1948 from director Howard Hawks with John Wayne and Montgomery Clift), a movie about cattle drives. 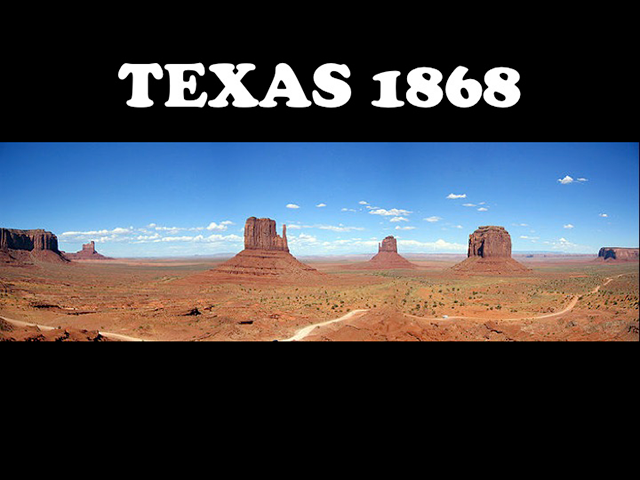 For those unacquainted with Texas geography, and that is almost everyone, this is a view of Monument Valley in Utah, and cattle don’t live here (no grass, no water). 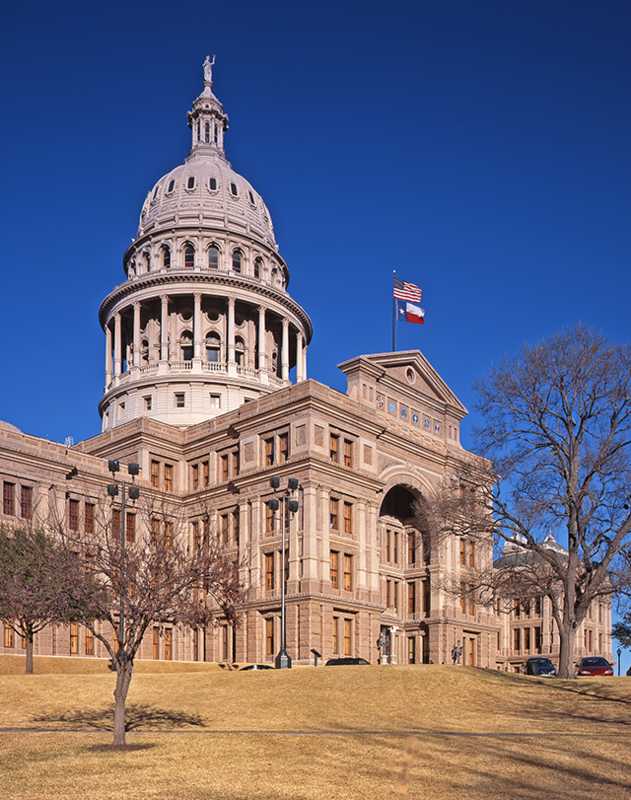 The Texas State Capitol (1888, Elijah Myers), at 302.64 feet, is taller than the 288-foot U.S. Capitol and larger in area than any state capitol. The 567.31-foot-tall San Jacinto Monument (1939, Alfred Finn) is 12 feet taller than the Washington Monument. Dallas/Fort Worth Airport, at 27.34 square miles, is larger than New York’s Manhattan. Although modest on the Houston skyline, the paired 36-story towers of Pennzoil Place (1976, Johnson/Burgee and S.I. Morris Associates) changed the course of architectural history. Not only was the flat top of the mid-century modern box clipped at a steep angle, but the sides were angled, too. The sheer, all-glass curtain wall, without cornice or base, stressed the simplicity and elegance of solid geometry over classical orders and materials. The largest stadium in Texas, and the fourth largest in the U.S., is Kyle Field at Texas A&M University in College Station. The eighth largest is the Darrell K. Royal-Texas Memorial Stadium at the University of Texas at Austin. Not far behind is the old Cotton Bowl in Dallas. 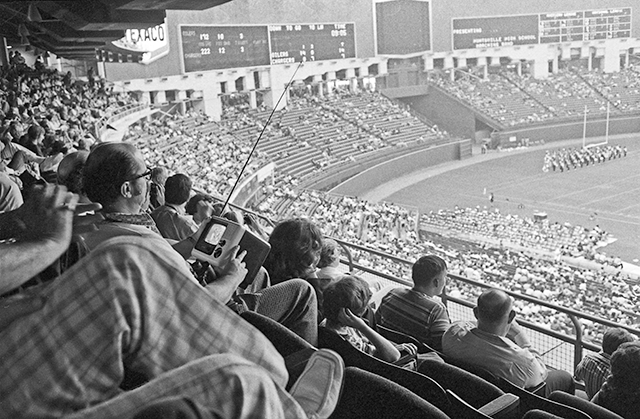 The 66,000-seat Astrodome (1965, Lloyd, Morgan and Jones, and Wilson, Morris, Crane and Anderson) was the world’s first enclosed, air-conditioned stadium. The 710-foot-diameter and 208-foot-high dome accommodated football, baseball, rodeo, car and motorcycle races, and circuses. Roy Hofheinz’s private suite was the precursor to the skyboxes that are an essential part of present-day sports facilities. Houston taxpayers now support four specialized sports venues (football, baseball, basketball, and soccer) to house what the Astrodome once did. In the vast Llano Estacado—along Interstate 40 in Carson County in the Panhandle—the 190-foot-tall “Cross of Our Lord Jesus Christ” rises against the flat horizon. Built in 1995 by Cross Ministries, the largest freestanding cross in the U.S., could be a landing beacon for the Second Coming, its shadow visible from space. While Texas has a few of the buildings that were the biggest of their type at the time of construction, “big” is also measured in the egos that built them and the skylines they created. North Texas boasts several good examples. Built by the Gulf, Colorado and Santa Fe Railway, it was a complex of four buildings (three remaining) for offices and warehouses atop an underground network of tracks. Earlier depots from 1884 and 1896 had occupied the site, and so those functions moved to the Union Station. The complex was the largest merchandising center in the region. 1922, Alfred Bossom with Lang & Witchell; 1999 adaptive reuse, Guy Thornton with Gensler. This is a 29-story Renaissance Revival tower. Its 30-foot revolving Pegasus, called “The Flying Red Horse” (1934, J.B. McMath), is visible above the roof for miles. It was the tallest building west of the Mississippi for 20 years and became a city icon. The bank is the tallest building in Dallas at 72 floors (921 feet). Its rival? The 75-story JPMorgan Chase Tower (1981, I.M. Pei and Partners) is the tallest in Houston and the state and 17th tallest (1,002 feet) in the U.S.
Megachurches of every denomination are found in towns and cities. Ranked as America’s largest megachurch, Lakewood Church in Houston has weekly attendance of about 52,000 and meets in the old Summit (Compaq Center) basketball arena. Second Baptist Church in Houston was rated second largest with attendance of over 23,000, the largest Baptist church in the country. Dallas’ cathedral Santuario de Guadalupe boasts the second largest Catholic congregation in the country. Game day at AT&T Stadium. Credit: Blake Marvin - HKS, Inc. 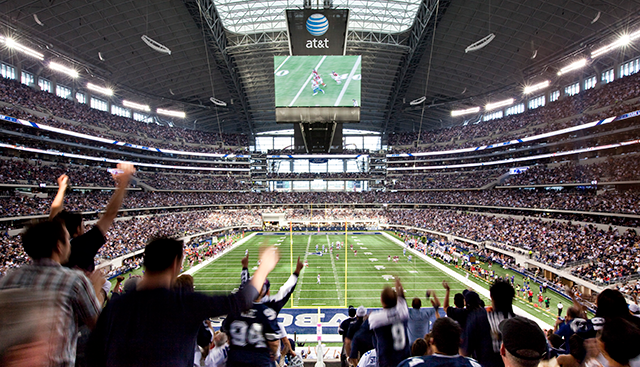 The Dallas Cowboys football franchise entertains sports fans from their 80,000-seat, $1.15 billion facility. Standing-room capacity for new structure is over 105,000 people. When built, the facility boasted several of the largest high-definition screens in the world which are centered over the field. The facility has over 3,000 LCD screens in suites and other locations. 1952, restored in 2013, SRO Associates and Texas Scenic Co. 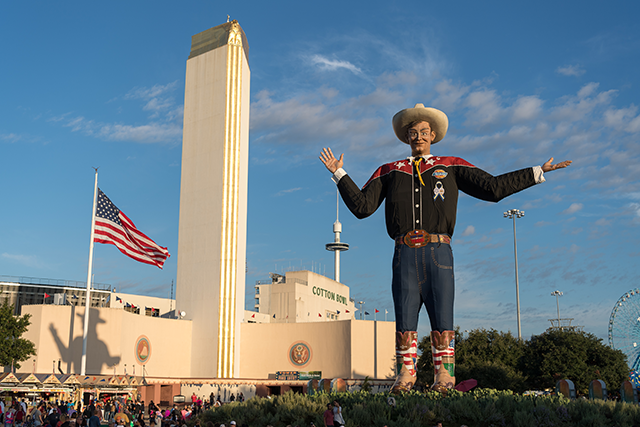 The 55-foot-tall Big Tex at Fair Park in Dallas is probably the tallest Texan, wearing size 70 boots and a 75-gallon hat. Howdy, Folks! Texans in general—and Dallasites in particular—cannot imagine another place with such a BIG history, culture, and mythology. It’s that mixture of fact and fiction that makes Texas’ such an iconic state; and its buildings and unique spaces serve to underscore that character. Texas A&M University is the second largest public university in the U.S. (58,515 students) after Ohio State University (63,016). The University of Texas at Austin (50,950 students) is the seventh largest. There is plenty of big money in Texas. Of the 540 billionaires in the United States, 33 of them are Texas residents. Texas ranks first in the U.S. in livestock production (cattle, sheep, and goats), with 13.3 million head of beef cattle. Texas grows a quarter of the U.S. cotton crop on six million acres along the Gulf Coast and in the South Plains, and ranks second in peanut production. Myth is the main “Big” in Texas. 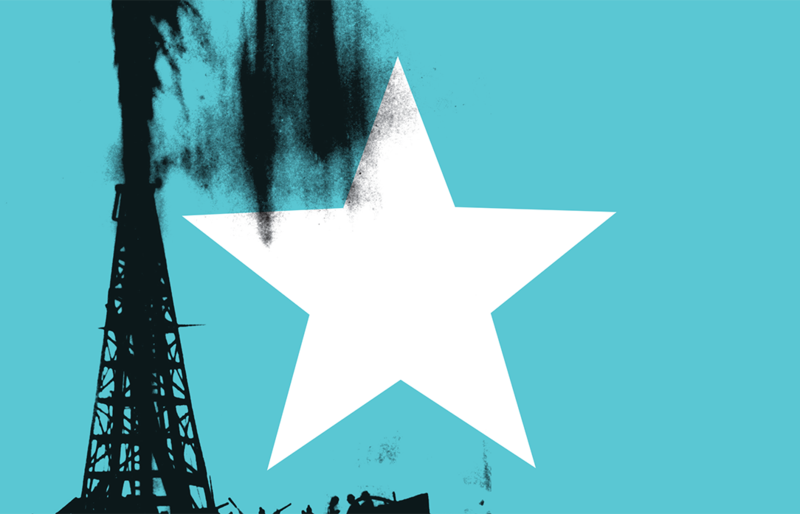 Texas myth is huge, not in relationship or comparison with other places, but completely self-referential (in a literary, Postmodernist manner). Myth is based on reality and oftentimes, reality is based on myth. Innumerable books, articles, movies, TV shows, music, and works of art have explored in fact and fiction the history, culture, and people of Texas: patriots, adventurers, and ne’er-do-wells of the revolution; the Alamo and its defenders; the misunderstood Sam Houston; settlement and demographics; ranching; oil and gas; food; and architecture. 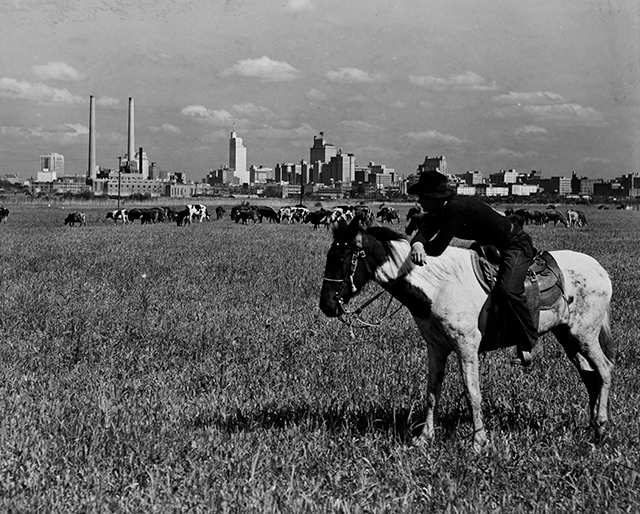 But no aspect of Texan heritage has been more richly, dubiously, and creatively interpreted than the cowboy. It is no myth that the attributes of the cowboy character have been assimilated into the American psyche: independence and self-reliance, endurance and fortitude, honesty, stoicism, and respect for animals and nature. The blending of herding techniques and material cultures originated on the Texas Gulf Coast in the mid-1800s. The big protective hats (sombrero) and leather leggings (chaps), sturdy saddles, and the use of ropes (lasso, lariat) were brought north by Mexican vaqueros and herding methods were a southern Anglo and Hispanic mix. “The Texas cowboy was an evolvement from and a blending of the riding, shooting, frontier-formed southerner, the Mexican-Indian horseback worker with livestock (the vaquero), and the Spanish open-range rancher.” After the Civil War, most of the drovers with herds originating on the Gulf Coast were former slaves. The epic but brief period of the cattle drives (1867 to about 1880) spread the Texas cowboy culture throughout the West. The Texas cowboy was a legend in his own time. Autobiographies, magazine articles, pulp fiction novels, songs, and poetry romanticized the cowboy life and created a folklore popular around the world, written by and about those directly involved in the cowboy life. Buffalo Bill’s Wild West Show and later Hollywood movies added myth to legend. After generations of exposure to Gene Autry, Richard Boone, James Coburn, Gary Cooper, Clint Eastwood, Dale Evans, Errol Flynn, Henry Fonda, Glen Ford, Hoot Gibson, William S. Hart, “Gabby” Hayes, Tommy Lee Jones, Alan Ladd, Lee Marvin, Tom Mix, Audie Murphy, Paul Newman, Maureen O’Hara, Slim Pickens, Roy Rogers, Sam Shepard, Jay Silverheels, James Stewart, Lee Van Cleef, and John Wayne, and purported Texas scenery the transformation from reality to myth is complete. Yes, everything is big in Texas, including the pride that Texans hold for their beloved state. Even those transplants from other states oft refer to themselves as “born again Texans” or repeat the familiar phrase, “I wasn’t born here but I got here as fast as I could.” Myth and history have made Texas what it is today and will continue to shape the future of the Lone Star State. Orlando Sentinel. January 14, 1999. Lamster, Mark. The Dallas Morning News. January 10, 2014. Texas A&M University Enrollment Profile, Fall 2015. The University of Texas System Quick Facts for Fall 2016. Moorhead, Gerald. Buildings of Texas. Charlottesville, VA: University of Virginia Press, 2013 vol. 1, 2017 vol. 2. Dobie, J. Frank. Guide to Life and Literature of the Southwest. Austin, TX: University of Texas Press, 1943. Pg 89. 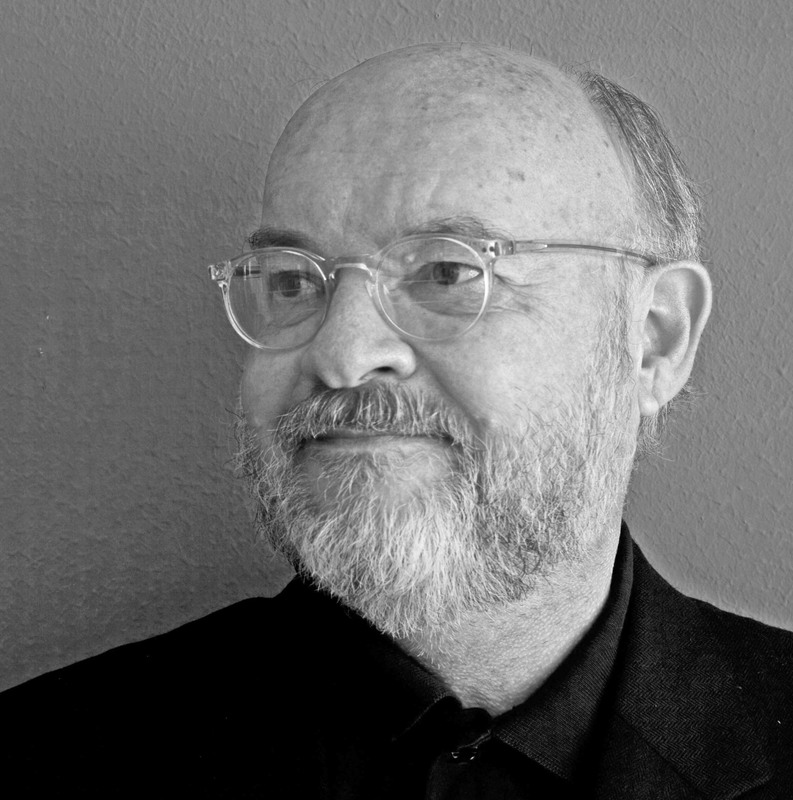 Siringo, Charles A. A Texas Cowboy or Fifteen Years on the Hurricane Deck of a Spanish Pony. New York: Penguin Press, 2000 (originally published 1885).